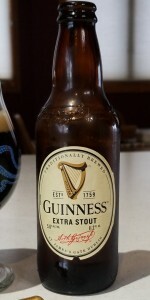 Guinness Extra Stout (Original) | Guinness Ltd. Presentation: 12oz short brown bottle. This particular batch was brewed under license by Labatts Breweries in Toronto, Canada ... dispelling the common belief that all Guinness in Boston comes directly from St. James Gate. Appearance: Black as night, with a rather creamy tan head; semi-sticky and dissipates rather quickly. Smell: Earthy esters, dark malts, mild aromatic hop bouquet of floral. Taste: Smooth upfront with a nice rich malt flavour. Some rounded malt sweetness pulls thru (almost get some molasses out of it, and some ripe dark fruits), but it gets swept away by a hop flavour that is a bit lemony, puckering. There's also a dryness to the brew that is amplified by the hop snap. The dryness carries thru in the after taste, along with some earth/grain husk flavours. Notes: This is the real Guinness, in my opinion. Known and labeled as their "Original," and actually, orginally, their Porter product during the 1700's (becoming their Stout in 1799). An exceptional Stout! The 60/40 nitro-injected stuff you get at the pub today is fairly new to this world (1961) -- it hardly stands up to this brew. Had any Guinness there might be on tap while on honeymoon with my wife in Ireland. It's pretty good to start with, but if you've ever had it in its home country, at the beginning of the biggest adventure in your life, with the love of your life, in a tiny pub, with a two minute pour and fresh salmon supper- you'd probably give it a five, too. every time i drink one of these i am reminded just how good it is. this is seriously special beer, timeless and traditional and famous for a reason. i think it does as good a job or better than any other beer of showcasing dark roasted barley in a relatively isolated context. its european and very dry sure, and obviously there is a flavorful guinness ale yeast at work here as well, but this is such a wonderful expression of the dark grain, its really in a class of its own. the color is coal black, the head is tan and creamy, and there is a profound nuttiness to the nose and taste, chestnut and bread crusts and the little burnt bubbles on good wood fired pizza crust. subtle dark chocolate and minerals, bone dry though, no sugar here at all, and its balanced in a unique way as such. i love the depth here, it seems to reach a little deeper than most on the grain side, and it always tastes fresh to me, which is so uncommon in an import. this grain flavor, wrapped up with the yeast, is second to none in this category, and its one of the beers of lore that really has held up to the test of time. i need to remind myself to keep this in the regular rotation, its one of a kind, and its a standard others should be held to. the depth of grain flavor and the dryness together make truly a classic! Total winner. There is no other stout. None. This truly is the king of the stouts. I've always tried to find another stout option, but no luck. Guinness - simply the best. How do you review a beer that is basically THE example of its beer class? Pretty much like any other beer I guess. Exceptionally dark clear brown colored beer that is the last stop head to blackness. Good light brown colored head that does eventually fall. The smell is sweet rich and far maltier that I remember it in the past when I used this stuff as an extinguisher for hot peppers in Albuquerque. Lots of biscuit malt and a good helping of toffee and coffee aroma. Unexpected fruity aroma from the yeast used I should have expected it considering where it comes from. I identify the fruit as mostly fig. Lots more chocolate aroma than I remember from the past, a pleasant surprise. The taste starts out dry with a fair amount of molasses and a stout roasted malt flavor with a sharp bitterness in the aftertaste. Flavor becomes more bitter as you drink it but the molasses only gets stronger and the hop flavor appears. A flowery perfume like hops flavor that I never tasted in this beer before. It is something of a shock and a realization that my ability to taste beer has advanced several light years from when I last tried this beer. The mouthfeel is full without need to resort to any nitrogen system. Much better than I remember it to be. Stiff and bitter but with much more to offer flavor wise than just char and bitterness. I have had a long history with this beer and only recently realized I had never bothered to review it. Mainly we used this in New Mexico and Texas because the bitterness could cut through the pain and heat of very hot foods, but there is an actual good beer here too. Appearance: This brew pours amazingly well. A wonderful deep chocolate. Head follows Guinness' tradition being very full with plentiful lacing. Excellent. Just Excellent. Smell: A wonderful coffee aroma surrounds the nose. Roasted malts underlie the flavor curve excentuated by faint alpha hops. Excellent. This brew is one of the top on the market. Taste: Sharper than a traditional Guinness, but not oppressive. There is an almost expresso presence...BUT the hop bitterness burns through what could otherwise be an overpowering presence. Mouthfeel: Carbonation is just about perfect. There is a foamy nature to this selection that is quite impressive. Excellent. Drinkability: The drinkability is amazingly high for a such a heavy brew type. This is my go-to beer. A little harder to find than the draught, but worth looking for. Recently found this beer in an 18 oz bottle. Appearance is great, dark chocolate brown with ruby highlights, thick caramel head that lasts with excellent lacing. Nice chocolate and coffee flavors, with a thick and smooth feel. If you're a stout lover (me! ), this is pretty tasty beer that is pretty easily available. Guinness for Strength! What a great beer. Let's face it - Guinness has set the standard for dark beers worldwide. Without Guinness, many people would never drink anything darker than a pilsner. I've had Guinness on four different continents... not bad for a beer that is dark as night. The beer poured a deep black color, but not completely opaque. There was a bit of light shining through the bottom and sides of the glass. Wonderful aroma of roasted malts and fruity esters, and just a hint of hops too. What balance - nice roasted malt flavor coming through with a decent amount of bittering hops. 6.00% by volume? That's definitely a strong and robust beer for an Irish Style Stout. This beer was thin to medium-bodied, and left me wanting more. Ok, I think I'll have another. 12oz. bottle poured into English pub glass. A: Pours pitch black, and lets little-to-no traces of light shine through, even when I hold up my cellphone flashlight to the glass. Guinness' trademark tan head sits majestically—about three fingers thick—atop the blackness. The head eventually deflates a bit, leaving some nice splotches of sticky looking lace down the glass. The head quickly becomes a creamy 1/4 inch cap that has incredible retention. It's there until the last sip. S: Roasted malts with some hints of dark, black coffee. A very tiny bit of chocolate sweetness manages to find its way into the nostrils. Not detecting any hop presence, but the coffee-like aroma is pleasing enough for me. T: A gentle molasses up front that offers a bit of sweetness. The sweetness doesn't last long, however, as it's quickly dominated by a very prominent bitterness reminiscent to a moderately strong brewed dark roast coffee, served black. I'm not detecting any of the chocolate notes my nose picked up, nor does any of the malty sweetness return (not that a black coffee drinker like myself is complaining). A very slight and short-lived appearance of hop flavor can be noticed as the beer makes its way down. M: This is where Guinness seems to let me down a bit... For a brew that looks so thick and delectable, and boasts some well-rounded flavors, the mouth presence is a tad bit weak. While not thin or watery, it's just not as thick as I'd like it to be. After the first half of the pint is through and the head is barely holding on, the body of this one is very... average. While I can't exactly talk bad about this, I can't really praise it either. O: At the end of the day, Guinness Extra Stout is my "go-to". Six-packs of it are easy to find, they're cheap, and a beer this dark usually scares away the BMC drinkers and keeps them from snagging one of my bottles while I'm not looking. While I'm not out here praising Guinness as the best beer in the world (because it's not), I can honestly say that I spend more money on Guinness than I do any other beer in the world. Very solid, very affordable, very worth it. Every time. An example of a great beer. Appearance is pitch black and opaque with thick head. Dark, malty smell with a hint of fruit. Almost similar to coffee. Taste is very malty and slightly bitter, very crisp and excellent hops. A slight corn taste to it. Body is thick with nice carbonation. A slightly dry and bitter aftertaste, not over board but enough to make this beer very drinkable and refreshing. Would highly recommend. Genuinely good Irish stout. Is a little lighter than expected, but still solid. If you're a fan of stouts, be a fan of this offering. To my mind, this is the best stout on the market today. After pouring this exceptional beer, the combination of pure black body and creamy brown head make it one of the most visualy appealing beers on the market. Taking that first swallow, the heaviness and bitterness of the beer, along with a smokey, slightly burnt undertaste, comes through immediately and stays long after the beer is gone. Guinness is a beer that keeps giving, it has one of the longest finishes I have ever tasted. I must confess, I don't see much difference between the various Guinness' I have tried, but if it says "Guinness", it must be good. A - Deep, dark, cocoa brown... Almost black with a ruby outline when held to the light. S - Not overly aromatic, reminiscent of whiskey mash, some hoppiness, a vague malt sweetness. A much more fragrant experience than the draught, that is certain. T - Perfect hop-driven coffee-esque bitterness. Slight malty sweetness. Rating of 5 from this coffee lover. M - Light carbonation; encourages much more a sip. D - Very high. I absolutely love it! This is probably my favorite to drink. Appearance: Pours black with a really nice frothy tan head. Nice lacing. Smell: Molasses, coffee, nuts, toastiness. Taste: Much like the smell, but with a touch of chocolate mixed in. I can't taste the hop but I can feel the bite. Mouthfeel: I love the tingling sensation coupled with the mildly astringent bite. I love this beer. It's easy to drink and full of flavor. Ok I admit it. I am of Irish heritage so I LOVE my Guinness, no matter what version. The Extra Stout is definitely their most flavorful version. It pours as black as any Guinness should and has a nice rocky tan head that leaves a ton of lace behind. Can you say beautiful? I did, so anyway it has a nice clean aroma, a touch of sweetness from the unmalted barley and some faint coffee like aromas make it really irresistable. The flavor is a bit more extreme, a nice sweet beginning that follows with a decent bitterness from the dark malts that almost overpower the experience. I probably shouldn't give it all 5's, but it is Guinness. Appearance  This one was beautiful right out of the bottle. It poured a dark brown in color with a full, heavily-tanned puffy head. The foam showed a lot of retention as it laced the inside of my glass on its way down. Smell  The rich, roasted malts are very subtle here at the nose. I can pick up some good brown sugar as well. The aroma here is simple yet very pleasing. Taste  The roasted malts come out sharp and raw at the taste. They are very bitter and need every grain of the sweet brown sugar compliment. The beer has an overall coffee flavor to it thats very enticing. Mouthfeel  This medium-bodied Stout has some bitter black burnt flavors with some good dryness in back of the tongue. I would have liked to have seen a bit more body to go along with the huge flavors, but overall the mouthfeel was good. I like this beer very much but sometimes is hard to get it. Guinness Extra Stout pours a very dark color almost black, Nice foamy head and very good lacing; Smell is malty and some coffee; Taste is of coffee, chocolate, roasted malts and maybe some fruit; Mouthfeel is great, good carbonation, very creamy, the finish is dry; Drinkability is very good. I really enjoy this beer; Probably my favorite beer. This was the beer that introduced me to the world of stouts and helped make them my favorite style. This is a complex beer with many nuances. Every time I try it, I pick up on another element to the smell or taste. This will likely lead to my amending this review. I honestly think there are inconsistencies from batch-to-batch due to larger scale production. I will focus on the features characteristic to best bottles I have had. Look- Amazing. There is no more appealing beer to me than Guinness in a proper glass. The beer itself is an extremely dark brown to near- black. There is a 1/8 inch thick, light tan head that stay with the brew until the end. The lacing is, of course, famous. It costs the sides of a clean glass in a way that is somewhat reminiscent of a spiderweb. Taste- The aroma carries over well into the taste. You can detect the molasses, for sure. It is even more pronounced on a really good batch. The coffee aspect is also present, but to a lesser degree. The taste is bittersweet, and the sweetness is heightened a bit more in the best batches. Feel- There is a nice, carbonated bite on the tongue right away. The bitterness is slightly astringent but not at all unpleasant. The swallow is just a bit creamy, and the bitterness is stays on the back of the throaty for a moment. Aside from the look, the feel might be the most outstanding feature of this beer, as it enhances the taste and overall experience. If the batch is fresh, this is one of my all-time favorite beers. If you are looking to see what a typical stout is like, I can't think of a better example. It pairs very well with desserts, especially chocolate cake. As mentioned, don't be surprised if each experience with this beer is a little different. It is regarded highly around the world for a very good reason. In fact, I have personally given individual bottles of this beer perfect 5/5 reviews in the past, only to drop the smell and taste ratings because of the inferiority of another batch. When it's at its best, this beer honestly merits top marks. Others have also noticed variances in quality, irrespective of dates. This probably has to do with mass marketing. A- Finger thick head, chewy-looking and khaki-colored. The liquid is pitch black, opaque and coffee-like. S- A bit of a disappointment for me as far as aroma. There's some sweet malt aroma, some dry roasted malt and a curious bitterness and slight sour mash smell. T- The taste is a big improvement from the nose. I got sweet molasses and malt first, then a hint of hops, and dry, coffee-like dark roasted malts. The aftertaste is the always desired and delicious baker's chocolate. M- Dry bitter finish, light medium body, good balance of sweet and bitter. There's more effervescence than I'd normally expect from a stout, so that was a bit of a drawback. Still, this beer really surprised me. I remember strongly disliking Guiness in my younger days, but this beer here is a very enjoyable stout. If not for the disappointing nose, I'd say this beer was great. I'm drinking one right now... there's just something about Guinness. Original Guinness is worth the 2 bucks more you may spend for it on a case as compared to the draught. A - Solid black with brown edging, full tan head, fading very slowly. Lacing of the first order. S - Full roast malt, tobacco and coffee, chocolate nib. T - Following the nose, with a gradual fade to bitterness. Slight minerality in the close, with a bitterness that hangs around on your palate until it is reset. M - Silky and smooth, fairly light, all told. The dry close is mild but persistent. O - An old favorite; full and tasty. If it is fresh and well handled, this shows why Guinness is stout for so many people. Poured from a 1 PINT 6 FL. OZ. bottle into an official Guinness pint glass. Room temp. Pours black with a dash of ruby-brown towards the bottom. Tiny bubble streams rising, initially easy to miss, 4.20 fingers of willowy tan foam, featuring many wee bubbles, a few huge, Soon the head narrows to 1 and a half fingers. Lacing present. Creamy, smooth, understated and dry. A rather different delight from the icy pints I'm so accustomed to. Mid gulp carbonation bubbles, a real tasty sipper, without patience it's lucky charms could be overlooked. Appearance: Poured a dark brown/black with a three-finger head. The head dissipated relatively quickly, leaving some gentle lacing. Superb! Drinkability: Dark and rich, heavy yet highly enjoyable. This is what a stout should be. Guinness Extra Stout (Original) from Guinness Ltd.